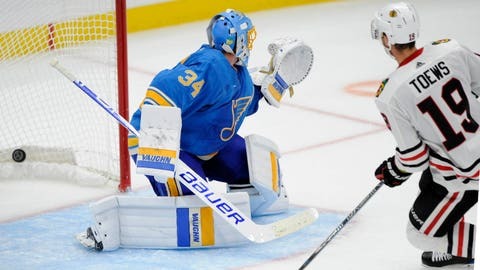 Jake Allen allowed five goals, including three to Jonathan Toews, in the Blues' loss to the Blackhawks on Saturday night. ST. LOUIS — Jonathan Toews can feel the rejuvenated spirit permeating through the Blackhawks’ dressing room after they missed the playoffs last season. Toews scored his third goal of the game 2:20 into overtime and Chicago beat the St. Louis Blues 5-4 on Saturday night. Toews tied it 4-all at 6:59 of the third period when he corralled the rebound of Alex DeBrincat’s slap shot and pushed it past Blues goalie Jake Allen. Toews scored the winner on a breakaway to give him his sixth career hat trick, and the Blackhawks their second consecutive overtime victory. Chris Butler put the Blues ahead 4-3 in the third just 22 seconds after Vladimir Tarasenko’s second goal. The goal was Butler’s first in the NHL since March 7, 2015, at Toronto. Cam Ward stopped 26 shots to improve to 2-0. Allen made 25 saves, but he and the Blues have given up five goals in consecutive games. Tarasenko’s second goal initially was not called a goal on the ice, but off-ice officials signaled to the referees to stop play for a video review 27 seconds after the puck entered the net. Marcus Kruger put the Blackhawks ahead 3-2 at 10:25 of the second period off a pass from Patrick Kane after St. Louis failed to clear the puck out of its own zone on multiple occasions. Toews’ first goal cut Chicago’s deficit to 2-1 just 68 seconds after Tarasenko scored his first goal of the season to give St. Louis a 2-0 lead. Kane tied it 2-all with his second of the season, but he was most impressed by Toews’ effort. Colton Parayko scored his first goal on a power play 14:42 into the first period to give St. Louis its first lead of the season. St. Louis center Ryan O’Reilly finished with three assists. Chicago became the third team in NHL history to open a season with consecutive overtime wins. NOTES: Blues LW Alexander Steen skated in his 900th NHL game. … D Jakub Jerabek arrived in St. Louis after receiving his work visa. … Chicago has won 44 consecutive games when Toews and Kane each score a goal. … Kane’s first assist gave him the fifth-most in Blackhawks history. He had been tied with Steve Larmer at 517. Blackhawks: Host the Toronto Maple Leafs on Sunday night in their home opener. Blues: Host the Calgary Flames on Thursday night.